Designed for airbrush artists who need extreme control of detailed spraying, the Iwata Hi-Line Series features dual-purpose, cutaway, pre-set handles, and tapered gravity-feed cups for easy cleanup and precise, efficient control of paint flow. Micro Air Control (MAC) valve technology gives you the ultimate in air control directly at the nozzle. The valve enables incremental control of airflow for fine to large spray patterns. The Hi-Line Series Airbrushes have PTFE needle packings for solvent-based paint. Larger threads on the nozzle ensure a more secure fit and better centering of the nozzle when it's installed on the airbrush body. Iwata's single-piece auxiliary lever/needle chucking makes for easy assembly. 0.2 mm Fluid Needle — Use this needle with Iwata HP-A, HP-B, HP-SB, HP-AH, and HP-BH airbrush models. 0.3 mm Fluid Needle — Use this needle with Iwata HP-CH, HP-BC, and HP-C airbrush models. 0.3 mm Fluid Nozzle — Use this nozzle with Iwata HP-CH, HP-BC, and HP-C airbrush models. HP-TH — One airbrush. Three spray patterns. The versatile HP-TH is adept at controlled stipple effects, plus round and fan patterns. It's a great brush for special effects makeup and costume applications. The HP-TH comes with both a round pattern air cap and a fan pattern air cap (which requires a compressor with at least 1.2 cfm). This airbrush features a 0.5 mm nozzle and needle combination and a generous 1/2 oz (14 ml) removable gravity-feed cup that's great for color mixing. HP-BH — This airbrush features an 0.2 mm nozzle and a 1/16 oz (1.8 ml) fluid cup. HP-AH — This airbrush features an 0.2 mm nozzle and a 1/32 oz (0.9 ml) fluid cavity. 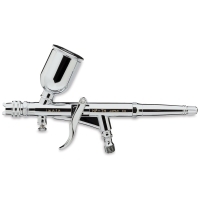 HP-CH — This airbrush features an 0.3 mm nozzle and a 1/3 oz (9 ml) gravity feed cup. The larger nozzle and needle are ideal for spraying a variety of paints, from watercolors to solvent-based automotive paints. 0.2 mm Fluid Nozzle — This fluid nozzle is intended for use with the Hi-Line AH, BH, and CH models. It is precisely made and tested by hand to assure accurate control and fine atomization of the spray. Unlike conventional nozzles made of brass, this steel alloy fluid nozzle is more durable and resists damage from harsh chemicals.